My goal- vision as an artist making this one of a kind art ceramic vase was to give it a look of old - antique distressed earthy piece that has been possible underground several hundreds of years.. compacted, buried and possible warmed and distorted by the passing years and climate waiting to be discovered once again. 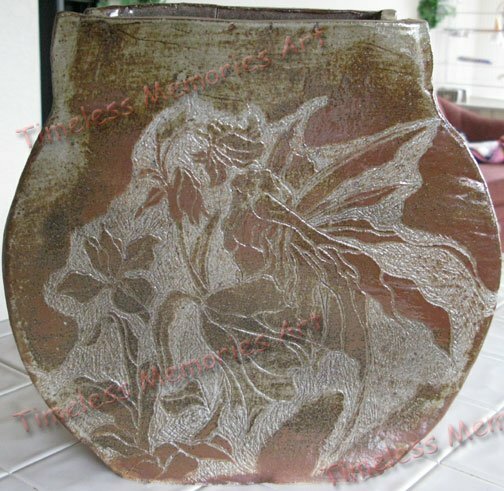 The ceramic Vase is a free form hand built with high quality clay slabs large vase with odd shape and tilt; I spend considerable time creating the art texture technique Sgraffito- slightly "scratched" the surface of the clay to give unique texture and create design of lilies and fairy in both vase views and sides. The term Sgraffito comes from the Italian word sgraffire meaning (literally) "to scratch. All four sides of this one of a kind vase had been embellished with Sgraffito technique. I distressed one side of the vase edge to give a crack edge then I applied different facets of glazes to this piece to give that earthy finish . Glazes were applies in and out the vase to a high temperature. Decorative piece is strong and solid.